This time of the season is one of our favourite times to fish because the catch-rate is above normal and is relatively consistent at this time of year. Bonnie Lee Charters is one the few companies that specializes in the winter fishery and we’re out on the water most days. This on-the-water presence allows us to stay up-to-date to the location of the winter salmon. 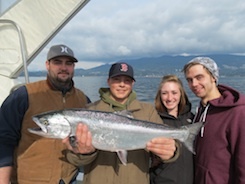 Our boats have been targeting the English Bay area for feeder Chinook salmon. These fish are aggressive feeders that are looking to grow. They follow the baitfish that present. This fall we have seen an impressive amount of bait in the harbor. These bait balls consist mainly of three to four inch herring with anchovy, needlefish, and pile-perch also being present. As we move farther into the winter season more salmon will continue to arrive. 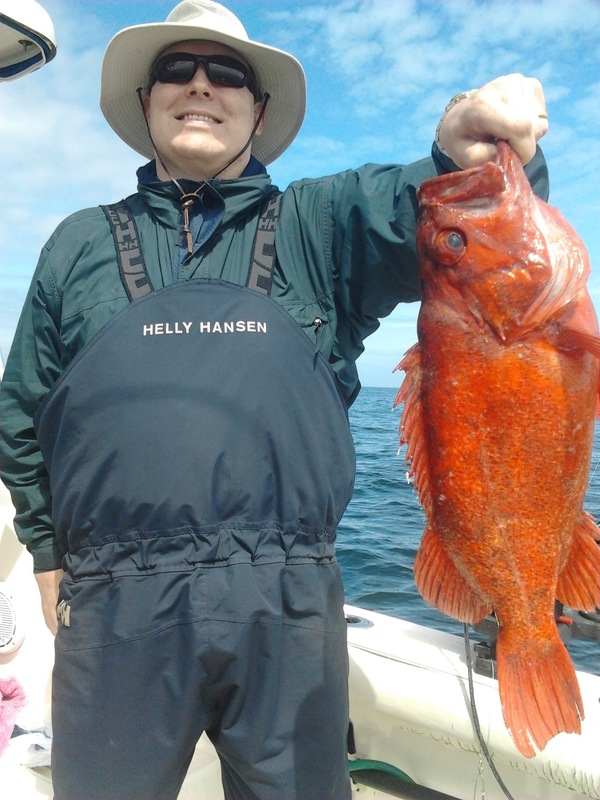 When fishing English Bay our guides tend to drop their gear close to the bottom, at depths of 90 to 140 feet. 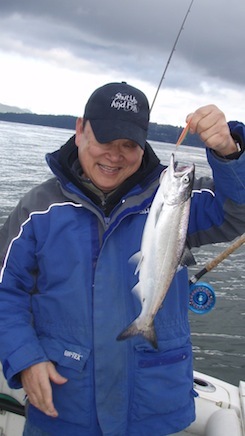 As we get closer to December, the Capilano area should start to produce more fish. The Capilano River fishery tends to be tide sensitive while the middle of English Bay fishery is more productive in the early morning. The guides will be using a lot of small 3 to 3.5 inch spoons. They are using silver or glow patterns; Tom Mack, Night Rider or Green Glow are the most favored. Flashers are used with all our setups with glow-flashers working best as we are fishing deep water where it is difficult for the light to penetrate. We are now setting crap traps with every charter. This is activity has started to improve. Because the commercial season is still in progress it is very important where you set your traps. Our guides have found an area that is consistently producing well. We have a crab-cooking burner on the dock if you want to cook your crab after your trip. Prawning is also an option on our longer 7-hour charters. At the moment we’re seeing about an average of 25 to 40 prawns per trap. Over the last week, we have had several days of rain and some fish have moved up the river to their home spawning grounds. However, we’re now back to great warm summer-like weather with nice, calm waters. The river levels have dropped back down so we should see some more coho and chinook sitting off the river-mouth this week. We’re fishing deeper, at depths of 90’ to 120’. Spoons with flashers are working best; we’re using the smaller ones in green glow and silver colors. Our later fall runs of Chum salmon have started to show and move into the bays - we are moving into the middle of English Bay to fish. This signals the start of the fall fishery for winter feeder Chinook. It’s also getting closer to our Dungeness crab season. We have tested a few crab pots this week and there were a few keepers of allowable size. This will consistently improve as we move toward next Spring and if our October guests prefer, we can try for fun and see what happens! Our charter fleet is primarily targeting the Capilano River area for big Chinook (King) Coho (Silver), and Chum salmon. We had a massive (over million) pink run this year and although it is mostly over, we’re still catching the odd straggler. 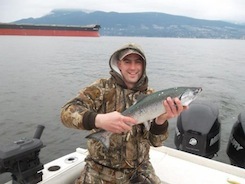 The few rainy days that we’ve had lately seem to have brought a lot more fish into the river mouths. From this area, the salmon stage and hold, while waiting to run their home rivers to spawn. Our catches have been varied but we have seen on average 2 to 7 keepers per charter, with a few extra bites not sticking. The bigger Chinook salmon have ranged well into the 30 lbs. size with the average weight being between 18lbs and 25lbs. We’re fishing mainly the bottom at depths of 60ft to 120ft. On high slack tides, schools of salmon have come to the surface and can be seen finning and porpoising across the water. Take this as an opportunity to run some gear up higher. Anchovy and hole herring in glow teaser heads have been the guide’s main choice. We have combined this with flashers although some of the staff using large whole herring are do so without flashers. If you are a novice or seasoned angler this is the time of the year to target our large trophy salmon. Overall the fishing has been a great the first half of September and our forecast is suggesting this is set to continue for the rest of the month leading into October. We are catching red, marbled and white Springs which are showing up in the 15 to 30+lbs range. They are really proving to be great action! The recent warm weather and very calm waters make for a superb day. We are still spending time trolling from Jericho to T-10 area while the Capilano is slowly starting to produce with the flood tide being best. We are running lines between 30-60 feet as we see most fish at these shallower depths. We’ve using a variety of pink hootchies, spoons and some anchovy and herring. Locate the schools of Pinks and drop your lines! The weather report for the next weeks looks like more summer ahead. The migration of millions of Pink salmon continues as they provide great consistent results with many of our charters still limiting out with this species. We have also seen the odd Chum and they have ranged between 8 to 12 lbs. in weight. Currently, the fishing has been “steady to great” and we are enjoying the thrill of landing Springs in the 20-30 lb. range. 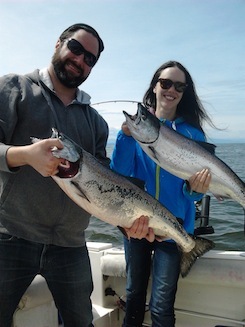 Our guests have been treated to hook ups with a range of fish and sizes – Pinks, few Coho and Chinook. The largest Spring recorded so far this summer has been in the low 30 lb. range. Stay tuned as we continue to enjoy the waves of migrating fish approaching the rivers to spawn. This week the action has been consistent as we troll using some anchovy with pink gear and some spoons – fishing depths of 20-80 feet. There have been days we are just using hardware. Choice flashers are Glow UV Green Onion and Kinetic UV Yellow-Green Jelly Fish. We’re fishing the Jericho mile markers, Bell Buoy and QA marker as well as longer days to the Fraser River North Arm and T-10. Trips range from 5-10 hrs., depending on the amount of territory you want to fish. Join us as everyone is having a good time trying their hand at landing the big one or telling their fish story about the one that got away! August is always a great month to fish! A variety of species coupled with lots of action and you have the ingredients for a great day on the water. Our “youngest anglers” have some happy catching times. Our location makes us handy for visitors to the area as we are just a short distance from all the major hotels, airport and RV sites. The fishery is changing the last couple of days with massive Pink run continuing and everyone having a lot of catching fun, as well as the larger Chinook salmon moving into the our area in increasing numbers (Bell Buoy, Jericho and T-10). Our angling guests have been losing and catching Springs, happy some are closer to the 25lb. mark, a great adventure! The guides are moving from pink hardware to bait/anchovy and running depths of 30-70 ft. Try a 4” green glow spoon or an Irish Creme spoon. 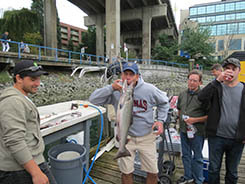 Our Chinook fishery will continue to build and run right through the fall. We have had 2 weeks of steady fishing action and fabulous weather! 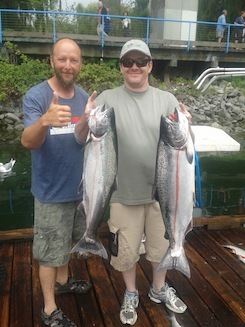 What a sunny summer we have been enjoying so far J The large runs of Pink salmon has been great for anglers of all ages and experience, as we land many per day, occasionally limiting out. 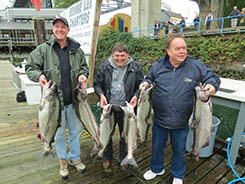 There have been many good results, with guests enjoying the best of Vancouver fishing. We have been trolling with pink hoochies and spoons at shallow depths of 15-60 feet. 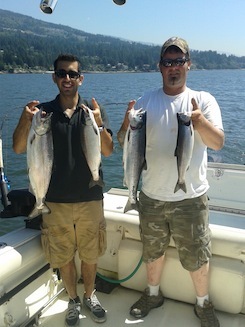 Our catch has consisted mostly of Pinks with a few Coho and Chinook sprinkled in. We have had a few slow half days but overall, the majority of days have produced fish and great opportunity. We are fishing fairly close home right now, so that gives us a chance to get our lines in the water as soon as possible. Yesterday, a guest landed a 25 lb. Spring so that fishery will be shifting to more abundance as the month progresses. Bring your hat and sunglasses and relax. Well, we are into the middle of June and its the time of year that we see a transition in our fishery. There are three fishing grounds to look at in mid-June. The Gulf Islands are still the number one place to be. We have had a spectacular run of large Chinook this year. Many charters have hooked up over 15 times with fish into the high 20 lbs range or bigger. Our boats have moved primarily into the reef areas of Thrasher Rock to Entrance Island. 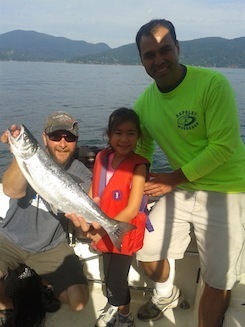 Over the past week we are not only catching Chinook salmon but also Coho salmon. We had a couple of days where we ran into schools of Coho salmon. The action was fast furious. 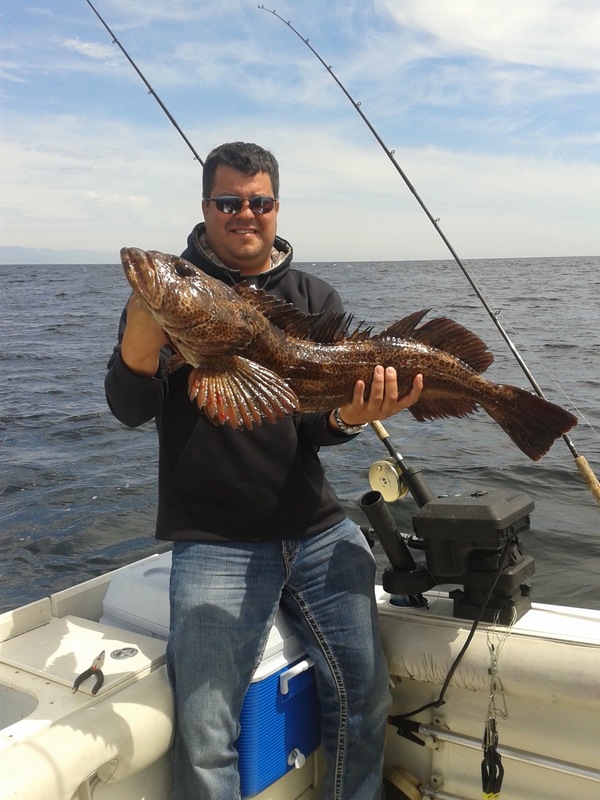 The lingcod fishing has been stellar with multiple fish being hooked. The big surprise has been the number of halibut being caught amongst the reefs. 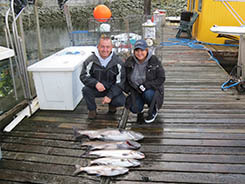 There hasbeen at least a dozen halibut caught in the last week alone. Some of these halibut have weighed over 40 lbs. Halibut normally a bi-catch as lingcod and salmon are the targeted species. In the local Vancouver areas we have met with mixed success. 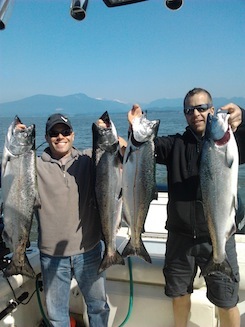 The QA marker and Hole-in-the-Wall/Bills Point have produced nice Chinook salmon. The best producing depths have been 110 feet to 140 feet. 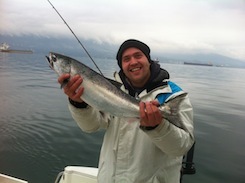 The West Vancouver shoreline has produced some nice Chinook salmon into the 20 lbs range. 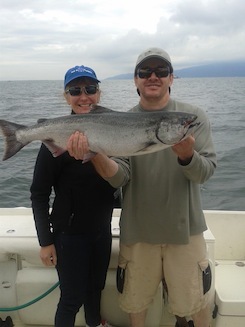 The Coho fishing has been spotty but this will quickly change in the next week or two. Crabbing has been very good. The Gulf Islands has been the top fishing area in the Georgia Straight. Our charter fleet has also had success on the Hump area off the south side of Bowen Island, with Chinook salmon into the 20lbs range. As we move through June our boats will follow the salmon schools into the reefs off of Thrasher Rock, Grande, and Entrance Island. 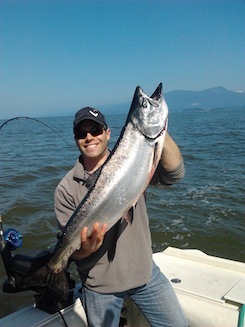 We have had a lot of charters that have limited out or had 8 to 15 hook ups of Chinook salmon between 8lbs and 30lbs. Two other areas that will start to produce shortly will be the West Vancouver shoreline and the Howe Sound area. The West Vancouver area will see the Coho runs start to school up as they wait to migrate up the rivers to the hatcheries. The Howe Sound area will see the Squamish Chinook start to arrive for their annual migration up the Squamish River. Our fleet has been running mostly spoons with double-glow flashers. The green-glow, Kitchen Sink, Homeland Security and Cookies and Cream have been our favourite spoon colours. Hootchies have also had their day but this season they tend to work well one day and slower the next. Bait is also good bet depending once again, on the day. Depths have been from 50 feet to 160 feet. The depth will depend on the schools of salmon in the area that day. Try multiple depths until you find the magic one. Crabbing has been stellar as this time of the year is the prime season. Traps are set with every trip and we have steamer on the dock for guests that want to cook their crab after the trip. 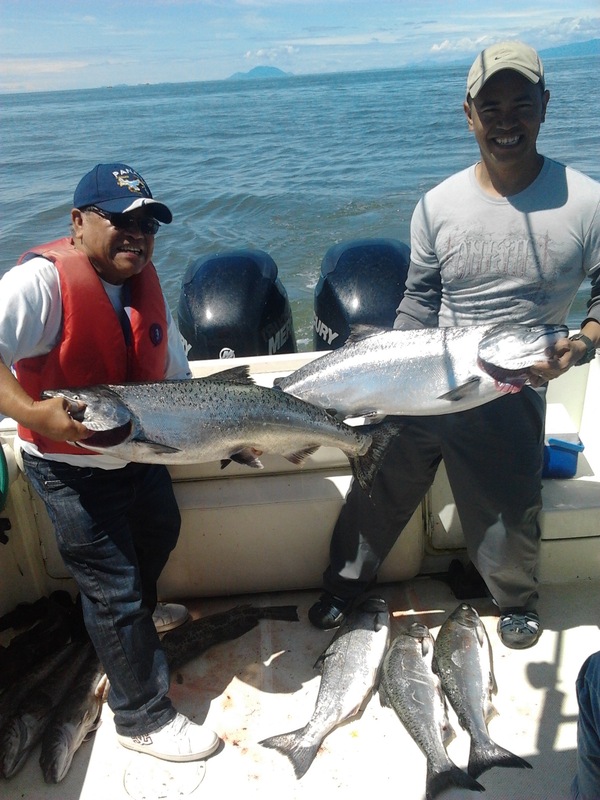 Salmon fishing has been great with many of our boats limiting out with larger than normal size Chinook salmon. It seems that through the winter and spring season we are seeing fat and healthy salmon. The commercial herring fleet has also seen larger than normal size fish and catch rates. This indicates healthy ocean conditions. Our charter boats have already moved off-shore and are fishing the Hump area off the south side of Bowen Island. 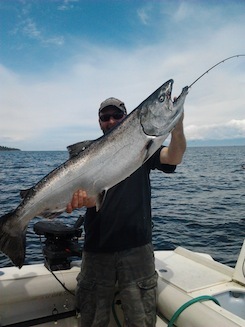 The Gulf Islands are also producing with Trasher Rock and Grande area being the most productive. We have seen fish in the 30lbs range with average size 12lbs to 20lbs. As we go through May and into early June we will move more to the Gulf Island side of the Georgia Straight. 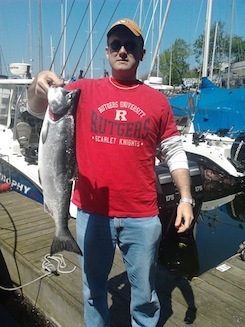 The middle of June should see the coho runs showing up in the West Vancouver fishing grounds. The coho run is predicted to be big this year. Our guides have being running spoons, such as Green-Glow, Irish Cream, Cookies and Cream and Strawberry Cream. Herring and anchovy rigged in glow head-holders are also working. Hootchies such as Spackle-back, Straight Glow, and the Green Ghost are all producing. We are running all glow gear as the springer freshet from the Fraser River has started. We are still crabbing but have suspended our spot prawn sets as the commercial has started. 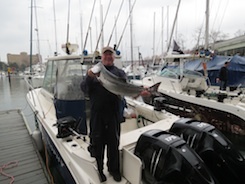 Spring is here and the spring runs of Chinook salmon are starting to show. Over the last three years these runs have materialized early with April 5th to 10th being the dates that we saw 15lbs to 20lbs salmon in English Bay and the Jericho-Bell Buoy areas. The normal return dates are the mid April. These fish are on the move so being able to track them is a key factor in having a consistent fishery. Our charter boats fish these waters on an almost daily basis giving them an in-depth and up to date knowledge of the fish runs. Our fishing areas will now move from primarily mid harbor to include Jericho Beach, Bell Buoy, QA marker, and the south side of Bowen Island and the Gulf Islands. Fishing depths will be from 40 to 160 feet. The depths will depend on the fishing area and the particular run of salmon we are targeting. The type of gear we will be running will consist of not only our favorite spoons but also anchovy and glow and white colored hootchies. The weather has been very good this winter with warmer than normal temperatures and lighter winds than normal. The light winds are important at this time of year because it allows our charter fleet to expanding the area of fishing providing greater opportunities. Traditionally the Howe Sound area and the west side of Bowen Island and the Gulf Islands tend to pick up at this time of the season. The area around the Gulf Islands seems to be producing the higher catch rates this month, with some fish in the low to mid teens. The Capilano area has slowed down from what has been a productive December to March timeframe. Our boats have been targeting mostly the middle of English Bay, as this is our favorite area at this time of year. 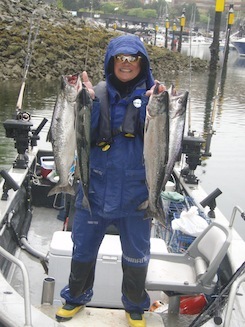 Catches have been good with ten Chinook salmon being about average. Most of these salmon are catch and release, as they are not the correct size to keep. 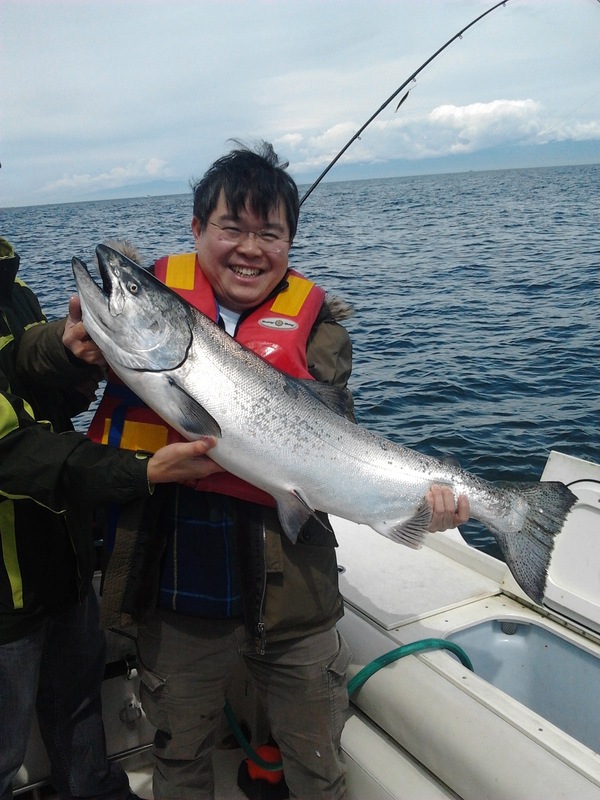 Our charter boats are still fishing near the bottom with depths of 80 to 120 feet in English Bay and up to 180 feet in depth in the offshore and Gulf Island fishery. Sliverhorde with flashers are still our normal set up. Crabbing continues to be stellar and prawning is good right now. 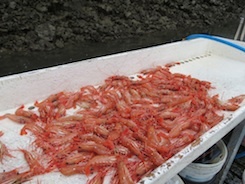 The commercial prawn season with start around May 1st so the next two months are your best bet for spot prawns. We use fresh salmon for crab bait and for prawning we use pellets, prawn oil and fresh salmon or tuna. This winter the weather has been quite pleasant with our usual cloudy days with light winds. Fishing has been steady with an average trip of four to 12 hook ups. 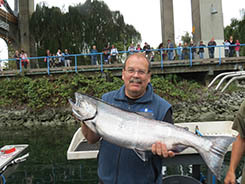 The Chinook salmon have been the larger variety with the Capilano fishery holding keepers in the 8 to 12 pound range. The middle of English Bay is producing a higher catch rate but with less salmon being of the legal size limit. Our guides have been using all spoons in depths of 80’ to 120’. Some of our favorite spoons are King Fisher spoons in the 3.5” size. Irish Cream, Cookies and Cream, Green Glow and Coho Killers have all been working well for us. Crabbing has been very good with limit catches being the normal. And, prawning has been steady. Crap traps are set with every trip and prawn traps set on longer trips.